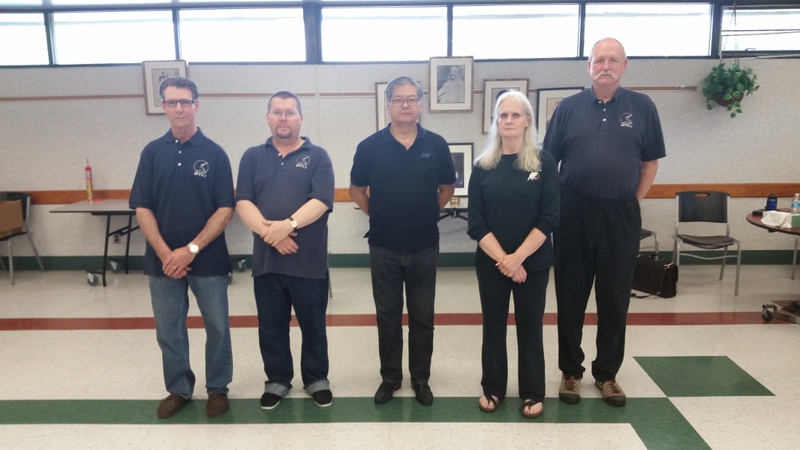 The Detroit area Michigan Tai Chi Chuan Institute (MTCI) was pleased to host grandmaster Eddie Wu Kwong-yu for a two day intensive seminar for over 65 people in Madison Heights, Michigan, on the 30th and 31st of August, 2014. The proceedings started Saturday with a respectful moment of silence for MTCI’s founding teacher, the late Stephen Britt, a long time student of grandmaster Wu. Grandmaster, assisted by Ann Arbor Wu style Academy’s sifu Genie Parker and MTCI senior instructors Michael Ashmore and John Marchewitz, presented 5 hours each day; evaluating and upgrading the level of our Detroit area students, demonstrating the importance of training the various Wu style forms to the international standard, and introducing stretching routines including the Tai Chi ruler, which was new to the MTCI students. One of the many highlights was grandmaster’s lecture on the benefits to Tai Chi Chuan students of traditional Chinese medicine, including the correct application and healthful effects of American ginseng. Each of the many students in attendance had personal attention and instruction from grandmaster, and we all came away from the event with many years’ worth of work to aid in directing our study of Wu style Tai Chi Chuan. The MTCI students and faculty would like to sincerely thank grandmaster Eddie Wu for his generosity, and we all look forward to many more visits in future.